Welcome to our English Cream Golden Retriever life! 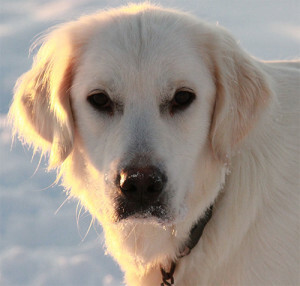 The breathtaking white blanket of winter that surrounds us is made even more beautiful by the creamy white coats of our English Cream Golden Retrievers. I wondered if I would lose sight of them in all of this snow but when Ziva looked at me with her spectacular, nearly black, eyes I knew I had nothing to fear! Thank you for being here with us as we work daily to be English Cream Golden Retriever breeders of integrity. Now, back out to playing in the snow!